Choosing my favorite Stephanie Laird card is not easy, but every time I see this card, I have to stop and admire it. There is something about the silhouette’s that Stephanie creates which are filled with emotion and they evoke feelings in me that either bring cherish memories flooding back, or make me feel as though I could step into the image and become part of it. 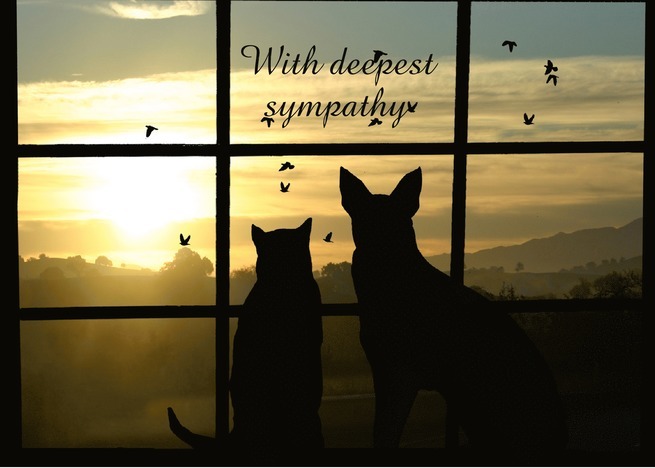 This card touches me because I have loved and lost so many companions over the years. Stephanie’s cards are like potato chips, you can’t have just one! This entry was posted in GCU Blog Carnival and tagged digital art, e-books, photoshop elements tutorials, stephanie laird by Doreen/Salon of Art. Bookmark the permalink. Doreen, so glad to read this piece on Stephanie. I just got one of her horse cards for a friend’s birthday. It is beautiful as is the rest of her work. Thanks for another great story. What a wonderful gallery of images from one of your favorite artists – nicely done! I’ll definitely be bookmarking her e-books for a future purchase – sounds like a must have for my digital library shelf. Thank you for that lead! Great find, first time for me..yes, wonderful cards with a simple software! I could not agree with anything more than your article on Stephanie has so well stated. Her gallery of offerings is amazingly wonderful and your display of them here is too. A big thumbs up to both of you! Doreen, what a great write up and love the unique display of Stephanie’s cards. I am on my way to her site to purchase the ebooks you recommended – right after I vote for Stephanie’s card. As a pet lover with many pet loving friends, I am drawn to this card too. Thanks for the vote Sue and you will really enjoy the inspiration Stephanie’s books offer – I still have ideas floating around my head that I haven’t the time to deal with just yet . . . LOL! Stephanie’s artwork is wonderful. I also went and purchased her e-books and look forward to trying some of her techniques. As always, Doreen, your article is top notch!